March 1st Well Day One is here. Odd feeling getting up this morning knowing we don’t have to go to work anymore. Spent the day getting ready, packing up the vehicle and finished organizing for plant watering, mail pickup etc. Finalized all the details and ready to head out in the morning. March 2 Gone on our way to Lethbridge to have lunch with Jess & Pen. Had a great visit and headed on the road. Jackie had her 3 apples confiscated by the border patrol . 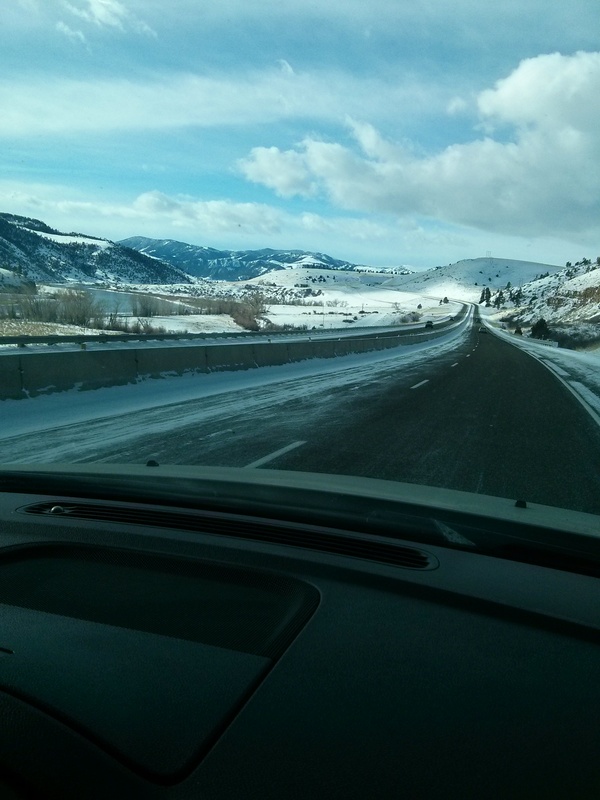 Roads were a little blustery with snow but ok to drive on. ( snowy roads I find are a lot more interesting than normal driving ). Ended up staying the night in Great Falls . Grabbed a few things to bring up to our room to have for supper and watched the Oscar’s. Got up had a wonderful breakfast and headed for the road. Didn’t take very long until we were caught behind 4 snowplows going about 20 mph for what seemed forever. I would guess at least 30 to 45 min on the highway as they tried to clear the highway over the pass. They received a lot of snow over the last few days and the roads had one lane covered and the edge covered. 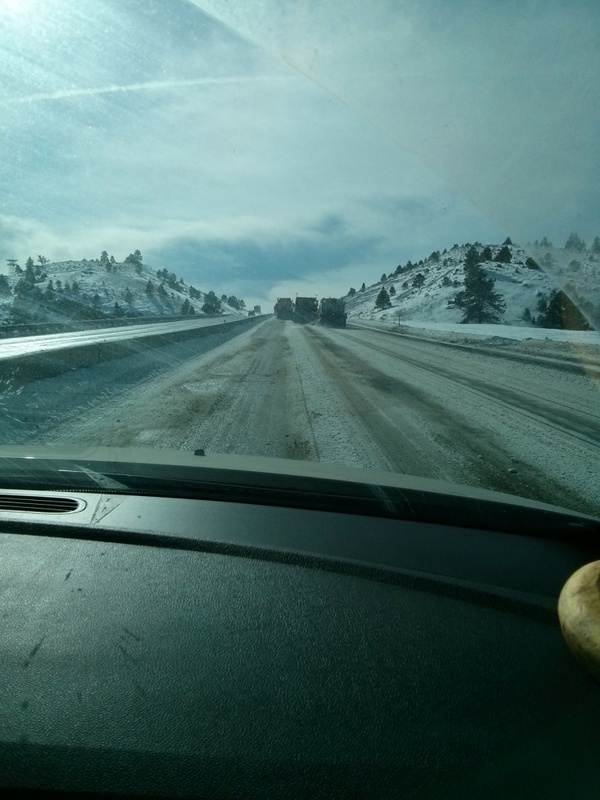 Great, passed the plows and headed down the I15 at a decent pace. Just got past Boulder and turned a corner and a 53ft van jack knifed across the highway wedged between the center rail and the guard rail. We were 4 cars back from the accident and waited for 1 1/2 hrs for the ambulance and police to arrive. Eventually they decided they had to close the Interstate and made all of us turn around and head back down the highway on the wrong side to get back to Boulder to take a detour route. Grabbed a map at the station and headed out on our single lane highway detour. Well some place along the way we missed our turn. But we did experience an amazing mountain scenic route thru Thompson Park and over Pipestone Pass which had 15 mph switch backs and a very winding road. A normal 5 hour drive from Great Falls to Idaho Falls took us 8 hours plus. Hey we don’t need to be anywhere quick .LOL So after two days driving we are still 1600 kms away from Mesa. Better day tomorrow as we have hit brown grass but the weather forecast is for rain at 45 degrees. Idaho Falls- Booked at the Holiday Inn, Went for supper at the Outback and had an amazing Pork Porterhouse. They asked me how I wanted it cooked. PORK ? landed at home in Mesa. Tired eyes but it was nice to sleep in our own bed. Setting up the internet, phones etc. 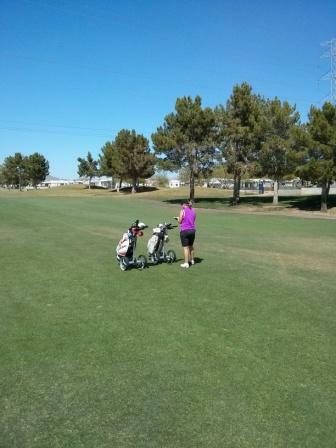 Practiced on the street with my new golf bag cart. Only issue is I can’t make 360’s but the range is amazing. The real course very soon. Tidied up and organized the place, re-visited with our neighbors and are all set. Going to Walmart to get a router and sim card. I see the weather is perfect in Calgary. Went swimming for an hour at 9 pm in the warm pool and hot tub. Fixed up a few things around the house. Closest organizer, hangers etc. Enjoyed a wonderful day outside in the warmth having breakfast and lunch. March 7 -Today was the try out day for our new remote carts. One word AWESOME. They worked very well, easy to control and the “talk on the course” Didn’t score well but first game and no fault of the cart. LOL Standard back pain issue but not pulling or pushing makes a world of difference. Wonderful day in the high 70’s .After golf went to visit some friends that were staying at the National State Park in their motorhome ( a huge 48′ footer beautiful thing) . 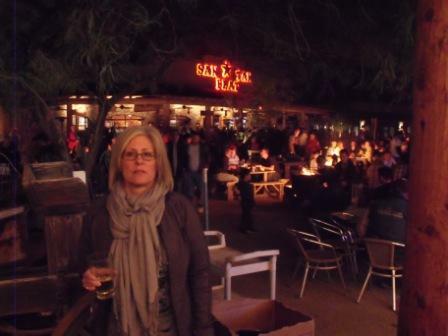 Had drinks and hot-dogs around the campfire.The park is great and right below the Superstition mountains. March 8 Picked 32 oranges off our tree in the front yard this morning. Super sweet tasting. Will eat some and make juice of the others. Amazingly good tasting. 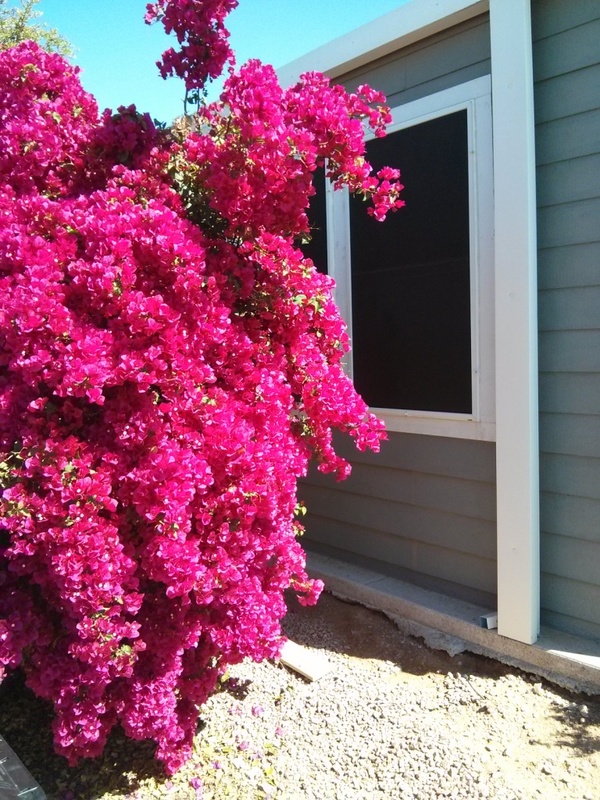 Off to Lowes to get paint chips as Jackie wants to change the color in the Arizona room. Went to the Mesa market to buy a new phone jacket as my phone was stolen and I need to get a new cover. 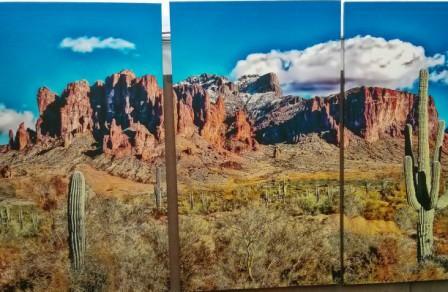 Ended up buying two pictures ($500) from a local guy to put in the Arizona room . We get to pick them up next Friday and hopefully they will look great. Worked on the sprinkler system, trimmed all the trees , and fixed up a garbage can cover. 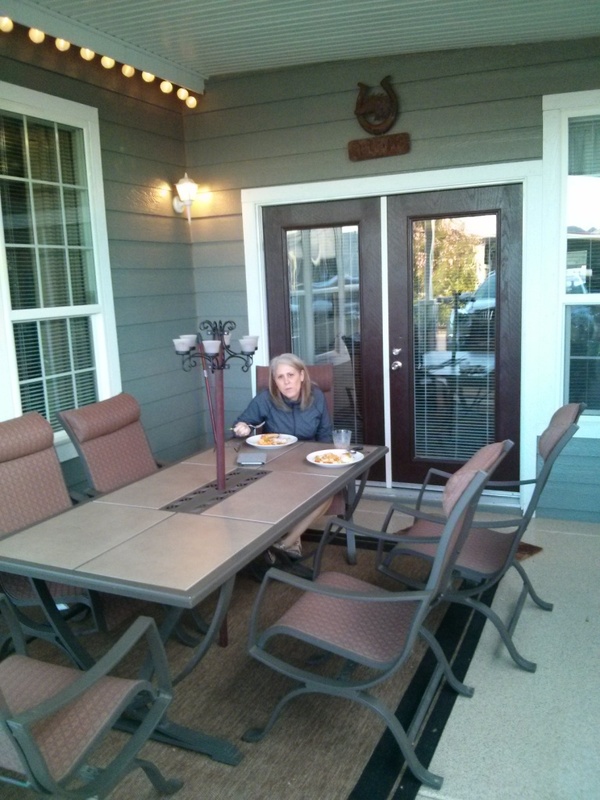 Had lunch and supper again outside on the patio in the warmth. Life is good.!! March 9 Fixed up the back deck with new chairs and palm tree. Second time golfing with the new carts . Awesome is the only word. One small accident as I went over a hill about 50 yards in front of me and unseen was a sand trap. My remote cart fell on its side spinning helplessly. Was funny though and a lesson learned. Golfed better even though the back is still very sore. My score was 86 and Jackie was 98 ( under 100!!!) . Golfed with an ex appliance store owner from Meadow Lake Sask.who just bought a new home two days ago. Great golfer.After golf sat on the patio at Fat Willys for a $5.00 burger and fries and a jug of Coors lite. Amazingly good tasting burger. With the golf, swimming and being active all day I weighed in my lightest since being 18 years old. 5 more lbs to make the doc happy. I am very happy to decide to retire now. It is wonderful. No BB, no phone calls , no 100 emails a day to answer. Blood pressure just raised thinking about it. LOL. March 10 Today was our work day. Started first thing after Jackie’s home-made Smoothie to move everything getting ready to paint. I frog taped the room and she paints. Good deal for me. Room looks good with a little Sante Fe color. Biggest issue today is what are we going to BBQ for supper. Quite different and refreshing. My good deed of the day was helping an elderly couple load their truck at Lowes. Very nice people just a little to old and feeble.Walked around the park, bought a few supplies from Lowes, curtains, screws, etc. Had a few glasses of a great tasting wine at the neighbors place. Heard about their amazing 31 day cruise coming up with stops in Dubai, India ,and even includes an African safari. Once in a life time trip.They had some incredibly good tasting wine. I guess they don’t buy the cheap stuff. Note had to revise day 10 as it seems this wine got to me!! March 11 Started the day with a 3 egg omelette stuffed with peppers,ham, cheese and onion. Best omelette I have made as I had lots of time to make it right. Trick learned is to out as much air as possible into the eggs.Worked on the back deck putting the face board around, caulked the back of the house as the sun had dried out most of the caulking.Another visit to Lowe’s and back to install the new trim work around the local artist pictures we bought. Took me a while to get the cuts perfect as they were like a compound mitre cut. Then our neighbor discovered when installing my new garbage cover I had inadvertently struck the main irrigation pipe. Dug that out and I am waiting for the Mexican landscapers to repair.Helped finish off the painting with Jackie and the room looks great. Booked golf for tomorrow at the oldest club in Phoenix ( 1912) . Just typing while sitting outside on the patio at 10 pm and 78 degrees. March 12 Another wonderful day in paradise. Went to the organic store to buy fruit and veggies. Got some 12 grain bread from a local guy. Then went golfing again. Another decent score just a few off shots. Getting warmed up for sure. Golfed with a nice gentleman that is a pharmacist that has the same thinking about the drugs the doctors are giving to people. Agrees big money has taken over and we are just pushing for profit not a cure. I won’t rant about this but nice to know even professional in the medical industry are skeptical of what is happening.Sitting outside again just enjoying the warmth. Reduced the weight by another pound. Yahoo ! Went swimming until about 10 pm than sat on the deck until about 11pm going thru Telus emails to eliminate any old ones. March 13 Had a 7 am morning call from a Calgary customer interested in giving me a job offer. I won’t look at anything for a while but the thought is appreciated. Picked up our new pictures from the Mesa Market today and installed them. They look fantastic. 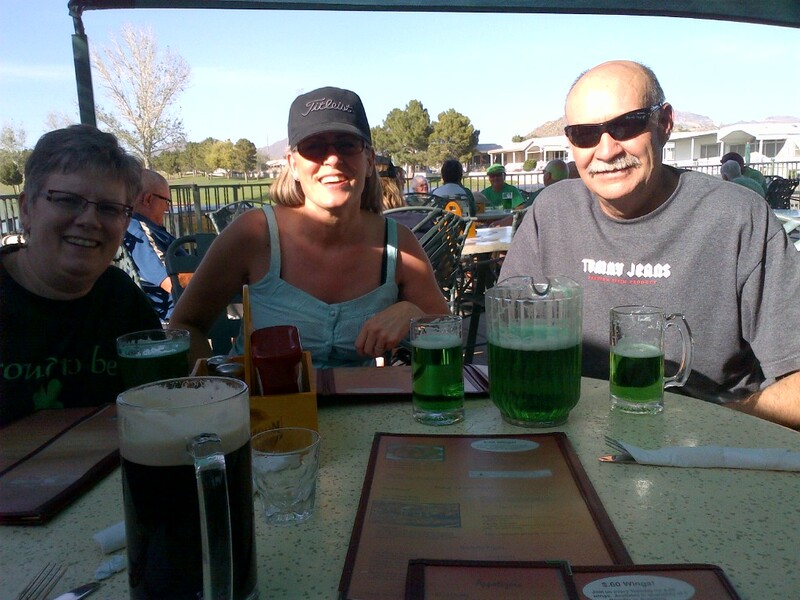 Just like looking out the window at the Superstition mountains.Put up our St Patrick’s Day decorations and lighting today, had our normal outside on the deck lunch and supper. Had numerous visits from our neighbors which we throughly enjoy. Stayed away from the wine today. LOL Need to save myself for Patty’s day beer.Just a relaxing enjoyable day.Jackie laughs as I look at my Telus, then Gmail and comment I can’t believe how few emails I am getting. Nice in one way. Getting ready for a big golf day with our neighbors tomorrow. Another chance to race the carts. March 14 Woke up to guess what ? Another wonderful 80 degree day. Got ready, had a hearty breakfast and then to the golf course. Jackie and I both played very well with a 87 and 107. Staying consistent anyways. There were a lot of goods things that happened just a few errors that caused the additional strokes. My hope is to golf low 80’s every time before coming home. Went to Fat Willy’s for an early supper which as always was fantastic. Had a great Skype visit with Victoria, Corey and Jackson. We looked at all of the snow in their backyard and were very pleased to be fortunate enough to be here. First windy day though that caused my Irish leprechaun to fly away down the street.Good thing my four-leaf clover was heavy enough to stand the wind. Did the books today which will become my duty each Saturday to track our expenses. Other than the odd “one of” purchase things are going ok.
March 15 Another 80 degree day !! . Going to Lowe’s again. Shopping at Target for runners to hike with and to run in the gym with. Plans are to go to the top of the Superstition Mountains. Doing the odd thing around the house, visiting neighbors and expect friends from Edmonton to arrive today. We have the wine and beer chilled ready for them. 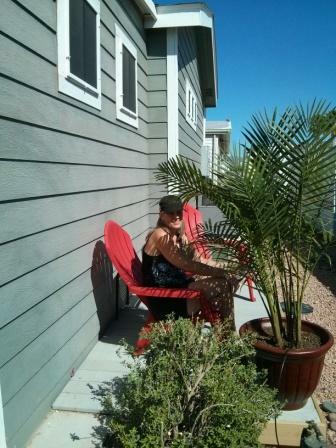 Enjoyed a beer on the next door neighbors pad.Jackie is sun tanning again on her new small rear deck with her morning tea. I have to build a retainer wall along the side of our house later this week. Time really does fly by but am enjoying every moment of it. A short gym workout and then to the pool tonight. 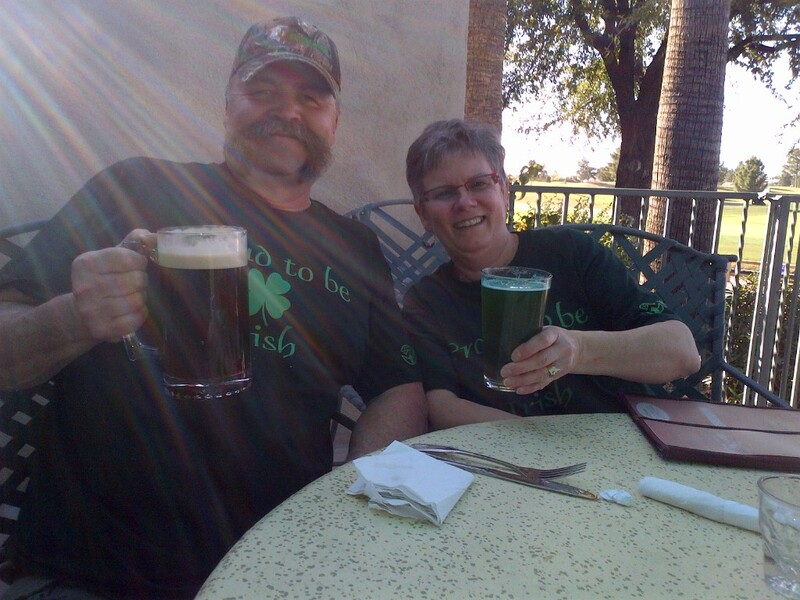 Fred & Terry have arrived and we will be having a $5.00 burger and pitcher of beer with them tomorrow night at Fat Willy’s.They will love the heat on the patio. Here is Jackie sweating in the 82 degree weather on the small back deck and enjoying her time on the side deck in the cooler evening. What more could you ask for on a hot day 92 degrees other than green beer and friends to drink with !! And Fred is a true Irish guy with even a fighting Irish Tattoo. 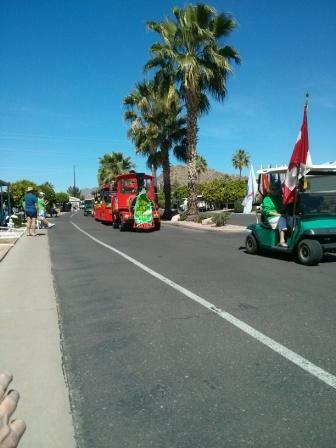 The parade was a lot of fun with numerous golf carts . March 17 Breakfast than off to Costco and Lowe’s for a few things including lumber for a retaining wall i need to build. Bought my Canadian Whiskey and Bailey’s kegs sized barrels at Costco. Started to dig in the retainer wall and drill holes for the 2 ft rebar I wanted to pound into the ground. Fred had his angle grinder along and cut the rebar to length. It was a good thing Fred was helping as pounding in the rebar with a round face sledge was challenging. I am sure he sweated more than he has in quite a while. On the last bit of finish work I hit the water line again. Ran to Lowe’s again to pick up a coupling.Rushed got ready and headed for our Tuesday dinner and show. This week we had Patty the Hypnotist . It was a decent show and fairly good fried chicken dinner. Ended up going for after show drinks at Fred’s place. Very very fortunate that I was invited to go Sturgeon fishing on the Mission River this July for a couple of days. ( bucket list item) Looking to catch a 200 lb plus sturgeon. March 18 Smoothie for breakfast. Garbage run in the morning and to check on gravel being delivered. $5.00 a pail vs $45.00 a tonne at the local landscape yard. Now just need to get a way to get it here as they only deliver 3 tonne or more. Went shopping at a huge antique store that had some amazing stuff in it. Jackie bought a “make up vanity” and chair for the bedroom. Had a couple of stops at Lowe’s again to finish the side yard. A few errands and admin jobs, relaxed , walked, and just had a fun day. March 19 Woke up to free paper again on the deck. Finish the wood part of the side yard in the morning and then golfing at 1 pm. I believe I only have the one side eaves trough and gravel to finish and I should be done.Then to help Fred do his driveway coming up soon.Read in the news we finally got rid of Redford as our Premier. Yahoo ! About time.Golfed quite well at 84 and Jackie again broke 100 with a 95. Had a Mexican supper with Fred & Terry, a few drinks and Terry & I killed the cribbage board game.A wonderful 80 plus sunny day again. Living the good life and so very blessed to be doing so. March 20 On no, another 80 plus sunny day. LOL Sorry. Off to the gravel pit today for a tonne of desert rock to landscape the side yard. Finished shoveling the tonne of stone, painted the front fruit trees with Fred’s help, ate lunch on the deck, looked at the weather in Calgary and laughed, cleaned the patio off, and just enjoying a wonderful day. Terry bought dinner and dance tickets for us to attend on the 28th. I have to scheme a way to pay Fred back for all of his help. The last 20 bucks I gave him he threw it our the window at me. I will win.!! I now have left the 20 bucks in his cab for him to find. 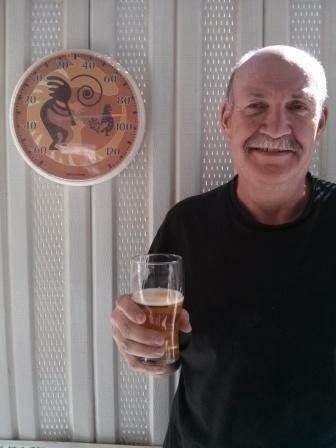 A very odd circumstance today as my beer is 30 degrees F and the outside temperature is 30 degrees C. What is really odd is that my beer is as cold as it can be without freezing and it is still warmer that Edmonton or Calgary’s outside air temp. I can’t help but enjoy !! Don’t tip and this is where you end up. 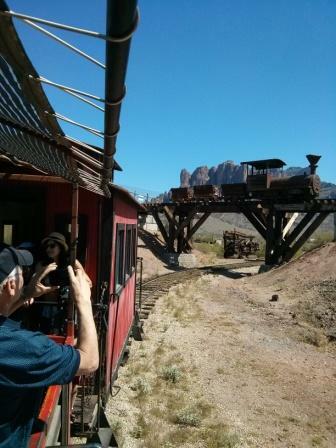 Riding a train with the Superstitions behind us going under a bridge. San Tan is this a Mexican girl ? Day 24 Another brilliant morning with the temperature expected to be 87 degrees. Having breakfast then heading of to Johnson Ranch golf club. It is a great course. Everyone golfed very well. During the game a weather advisory came thru our phones. It was a wind warning dust advisory caused by two straight days of close to 90 degrees. Had a couple of wind assisted holes and then everything was fine. 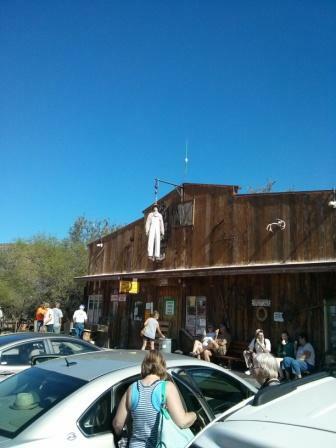 On our way home we decided to stop off at the San Tan Flats BBQ which has the best food you could ever want. Jeff & Wendy went for the huge racks of ribs, Jackie had a Jack Daniels chicken and I had a fantastic steak with loaded bake potato , creamed corn bun etc. 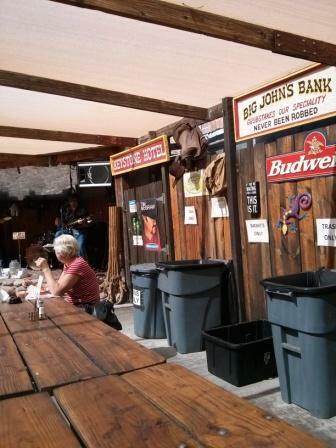 Awesome place with it’s outside fire pits, marshmallow cooking, band stage and out side walk up bars. A great evening with amazing food. 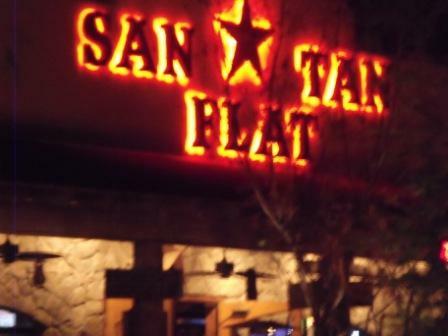 If ever in Mesa/ Queens Creek a for sure place to visit for atmosphere and great food. March 25 We had a fairly early start to head up to Sedona. 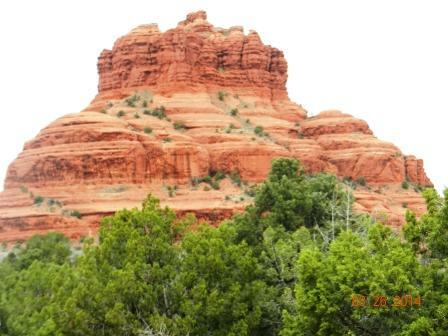 Sedona is the famous spot for the Red Rock Mountains. It is a quaint nice small town that would be considered a tourist trap by most people. It is collection of shops all geared to tourism, spas, tour guide outfits with trolley cars, pink jeeps and off road adventures. It is town with a population of 14K and gets 4 million tourists a year. We went on the trolley ride to see all of the hot spots. Drove by the church in the mountains and had a picnic lunch at a road side rest stop all of time with the red mountains behind or beside us. The urban legend in these parts is that the mountain has special spots on them that they call a vortex which lets you find your inner self. I am standing beside me self but couldn’t find my vortex. More psychic readings and spiritual locations then anywhere. It caters into the women attending spas and “finding” themselves. Interesting to know the divorce rate after such weekends. LOL All of us thoroughly enjoyed the day. It was about a 2 hour drive each way. It was at least 20 degrees cooler than we were used to. When I got back I checked the Canadian weather and sorry,laughed. Still snowing. 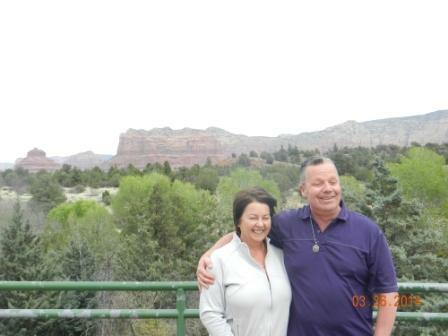 Fred & Terry Keys on our Sedona road trip. It was very cool out that day. The Red Mountains. Sedona has a vortex that is supposed to bring a instant peace to ones self. March 26 Up early to golf at Kokopelli Golf club. A nice course in decent shape. A warm 75 degrees. I scored a 38 on the front nine but ended up with a 82 after a lost ball and a couple of missed putts. Jeff had an off game today but Wendy & Jackie did very well. Back home to rest and discovered the water had an issue and is locked off while they fix a main break. Needed this to happen before we head to the Opry smelling a little from golfing in the heat.Started getting ready for the Opry and had to speed Jeff to a chiropractor as his shoulder was really hurting him. We speculate that an earlier club throwing event on one hole may have caused him to over extend his muscles. Fixed him up and went to a fantastic dinner and show featuring CC Ryder at the Arizona Opry. Anyone in town should go to one show as it is a very nice venue. A few cocktails after the show and then to bed around midnight.Happy Birthday Jessica & Victoria ! March 27 We had a tee time booked for this morning but with Jeff’s shoulder in pain we decided to forego and just relax before driving them to the airport. Stopped at the Big Fat Greek restaurant for a quick lunch. Good food with most of us having a pita with chicken soulvika.Got Jeff & Wendy to the plane on time which at the Mesa airport is only 10 minutes away. 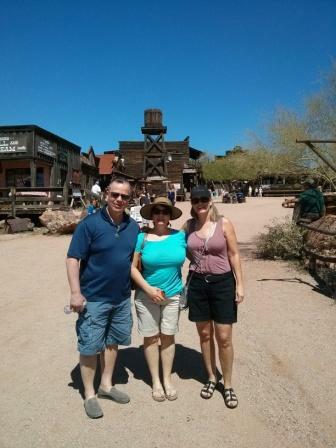 We hope they had a good time on their visit. I know Jackie and I enjoyed having them and I always thoroughly enjoy the opportunity to tease good friends. We had some great golf games, excellent crib games, dinners, shows and laughs. As hard as we tried to convince them they should buy now to have a place ready for them in a couple of years we couldn’t. The accountant in Wendy just wouldn’t relax enough. Oh well we can work on them this May long weekend to get a RV to join us on a few trips.We had a dinner & dance booked for the evening which was fantastic. 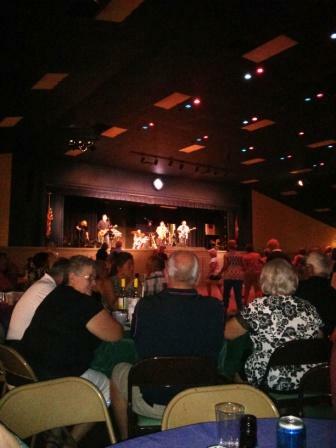 $ 5.00 got us a pasta dinner/salad and desert along with a live country & western band that was very good. The beer at the bar was only $2.00. Have I mentioned this re-engagement life is pretty good. LOL . March 28 Off to see if Fred needs help with his driveway.Terry and Fred did an excellent job in putting down the epoxy and colored flakes on their parking pad. Looks fantastic. My job was in the supervisor position and I think I did quite well at it.With all of the attention Fred got on his job he could, if he wanted have a cash business doing a lot of pads for his neighbors.Just doing the books today, trimming a few trees and relaxing. Temperature on the outside again is 90 degrees.Booked a tee for Monday at Viewpoint and looking forward to another $5.00 burger night at Fat Willy’s. Think we will just veg tonite, go for a walk and swim. March 29 First cooler day in Mesa. Should only reach 75 degrees today. Out on the deck this morning typing with breakfast and still appreciating the warmth we have. Had a very nice evening chat with our neighbors across the street. It is always so interesting to hear the stories of a time a long time ago. They had to escape Nazi Germany and flea to South Africa, their adventures in Africa, how they met in a factory and then coming to Canada which was an episode in itself.Very very interesting stuff. Fortunately Jackie’s and I’s life doesn’t have quite the adventure to it as some of the older couples had to endure. We won’t have the exciting stories to tell. But we did experience live before cell phones, internet,digital camera’s , ipads etc. Going to Campers World today ( favorite store in the world) to check out new stuff for the RV. A laid back day ending with a supper invite to Fred’s place for a steak dinner. Still able to keep active, keep below our target weight and have a few beers. 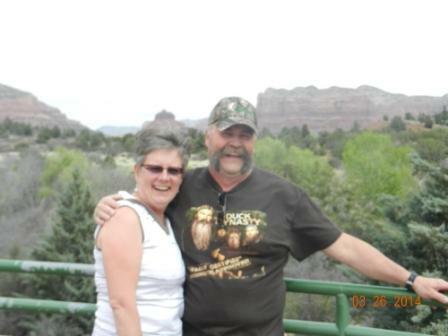 March 30 Bought a new bike rack for the motor home as the boat motor will be in the rear carrier on the Jeep now. Fred picked up a few RV things he needed so all is good. He bought a cooler for $6 on the clearance bin which is a deal and a half. Jackie and Terry went to Macy’s for makeup and some shorts. Fred and I sat on the deck tasting his 30 degree cool beer in a frosted mug. Had an amazing supper with Fred & Terry making us whipped/stuffed baked potatoes, marinated steak and asparagus along with too much beer, wine and rye. Needed the walk back to our place. Got a message on the arrival date of Tor, Cor and Jackson so looking forward to the spots we have picked out for them to see. We have a train ride, a petting zoo, a water park, outside BBQ pit restaurant, ghost town, and a gun fight picked out. We will see how much we get done. Time is short remember.LOL Ps: Fred and I dominated on the cribbage board again. and I shot my best score of the year so far at 80.Fat Willy’s patio engagement for the $5.00 Burger specials and $8.00 jugs as usually was excellent. Walking the 18 holes in 90 degrees with no cart girl today wore on me a bit so headed home , watched the Blacklist and went to bed early to an sleep instantly. Thought ! Trust me it is scary to leave the paycheck but it is extremely rewarding to be free. Some one carrying on working to later in life may have a nicer home, go on a two week exotic vacation, have a new car etc but you have 365 days a years to enjoy life 24 hours per day that they don’t even come close to.The two things aren’t even in the same league. Do it ! !